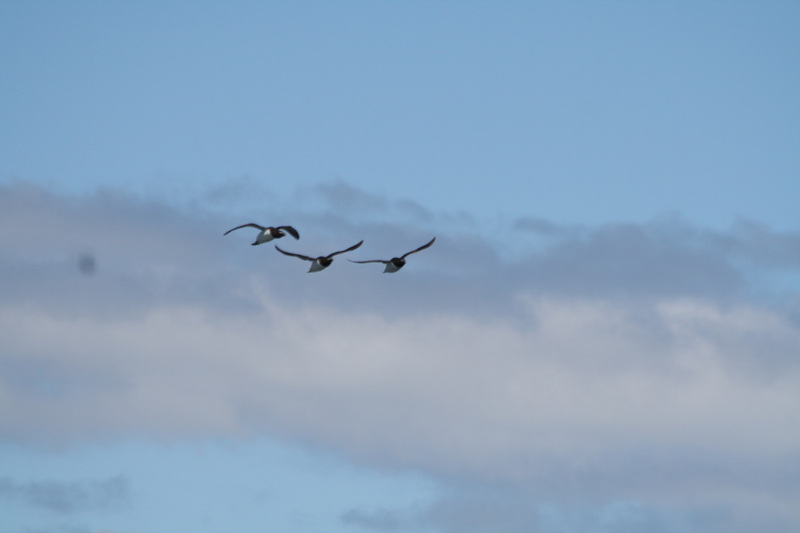 Capable, Efficient, watertight, la petit Pengouin, among regional alcids razorbills are top duck, (les Pengouin there are no more). 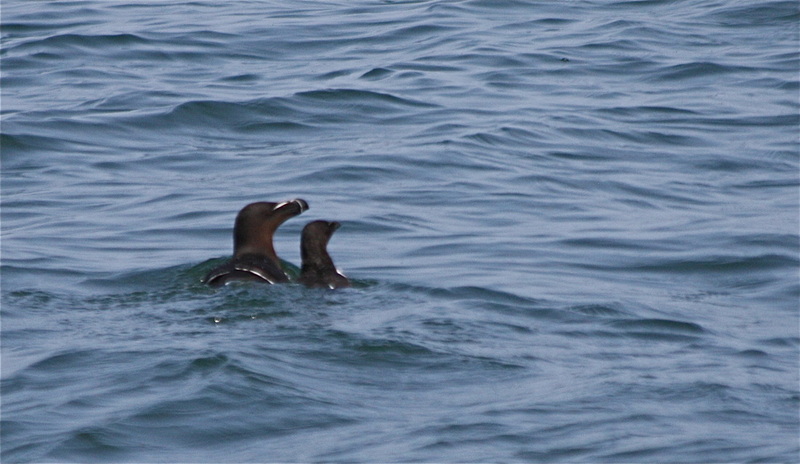 Razorbill chicks leave the nesting Island about 2 weeks after hatching, they swim off with the male. 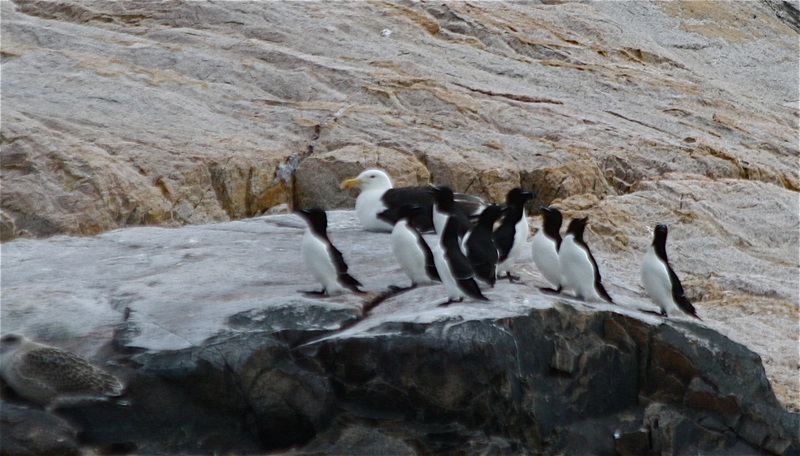 Yellow Murre Ledge, South of Grand Manan, 100 pairs of Razorbills reported in 1939, 65 pairs estimated in 2004. 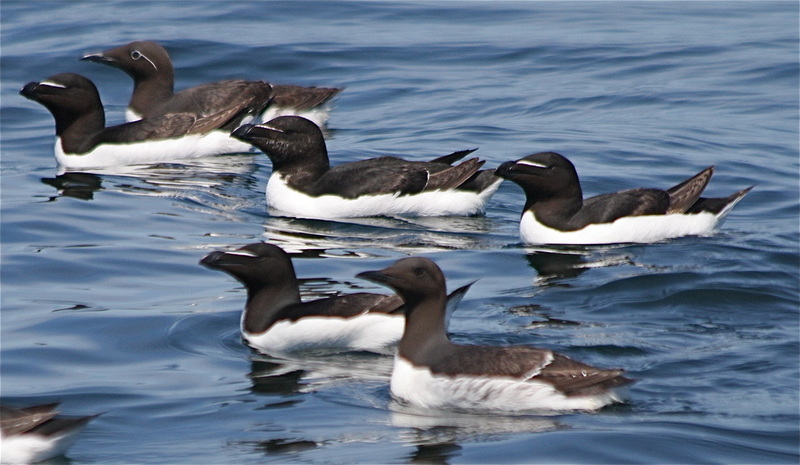 Maybe if this apparent decline is accurate it may be because of the competition for limited space with the growing Murre population on the ledge. 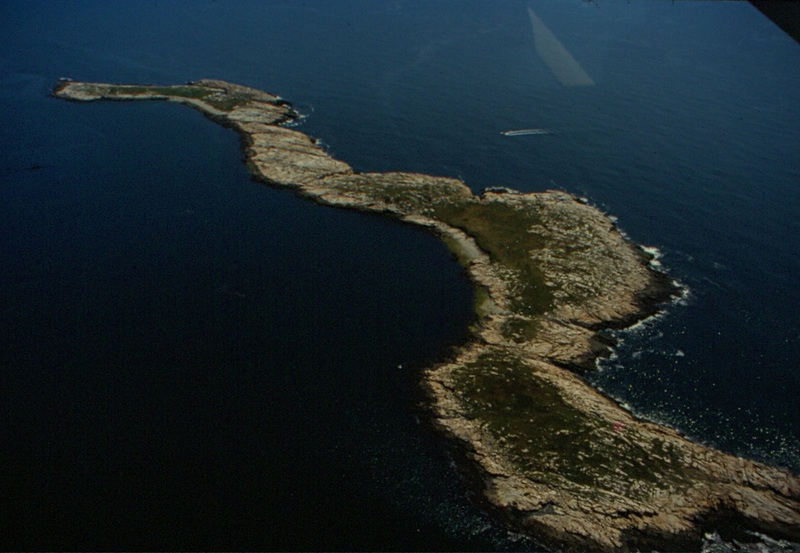 Old Man Island Washington county, a razorbill Island. 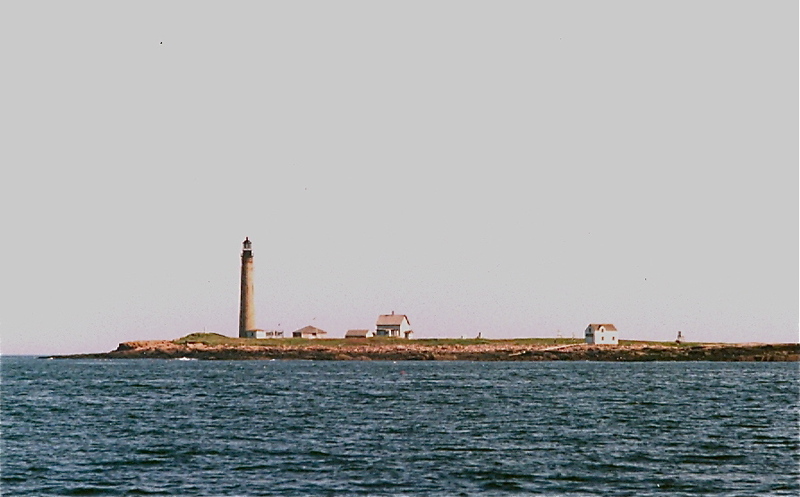 In 1975 there were 40 individuals attending the island. 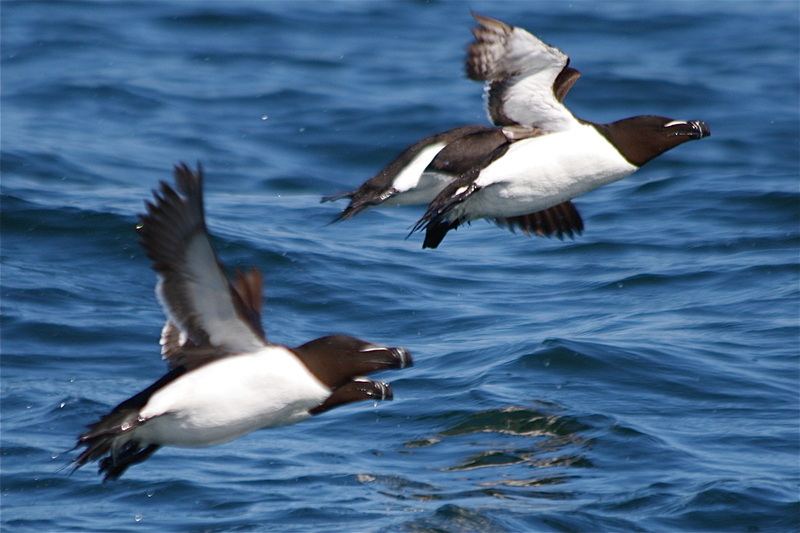 there are particular areas on the island that the Razorbills find suitable, they are concentrated in those patches of habitat. 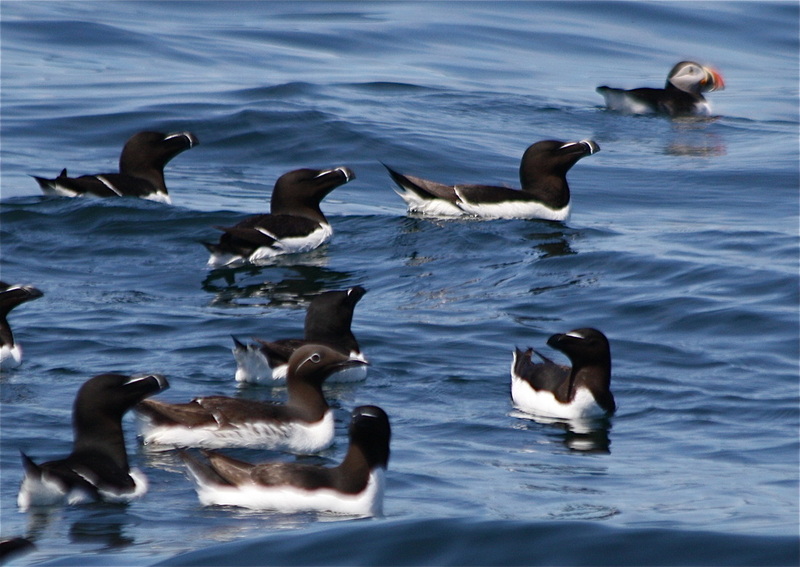 I counted 150 in 1998 and 230 razorbills around the island in early June 2008. the number of birds around a breeding colony varies with date and time of day but these few samples reflect the swelling trend in the regions razorbill population. 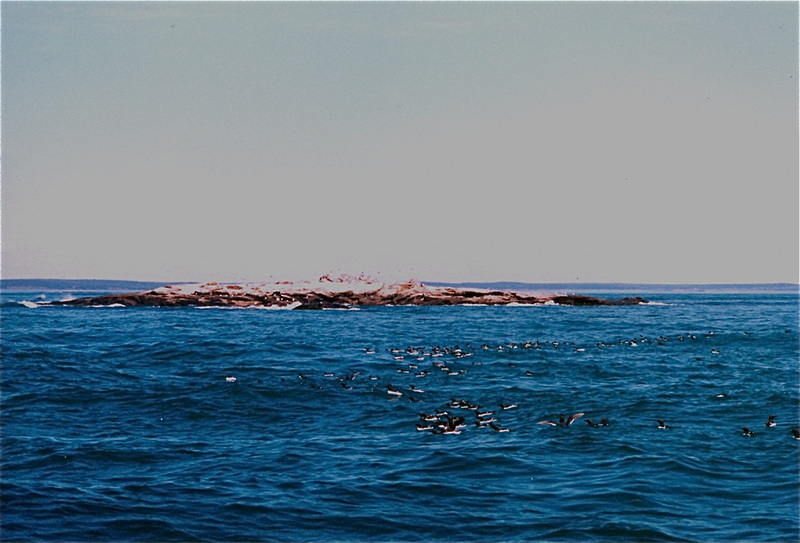 Freeman Rock, another razorbill Island, the razorbills live in the big crack on the middle of the photo, under four razorbills flying low over the rock. There was an estimate of 3 pairs from 1987, in 2006 I made an estimate of 55 pairs. 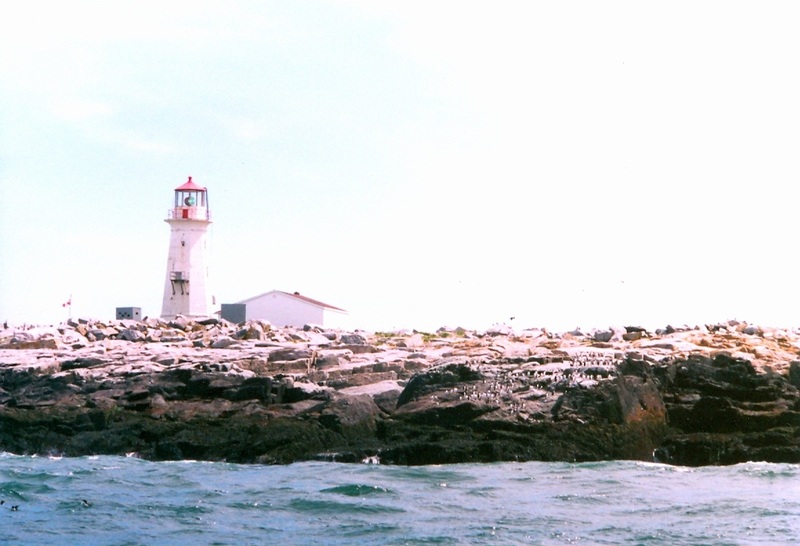 Pulpit Rock, razorbills expanded to this islet, in about 2000. not much breeding habitat on this one either. 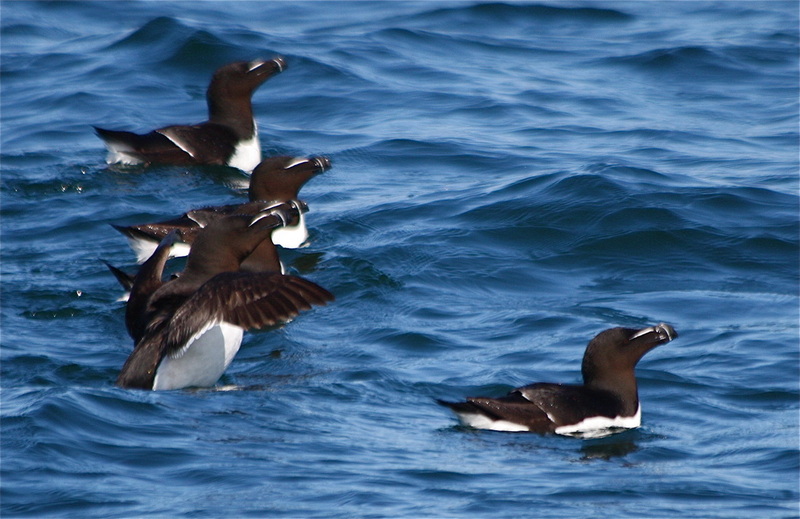 Razorbills were first reported breeding on Petit Manan in '96, there were estimated to be 5 pairs breeding there in 2011. 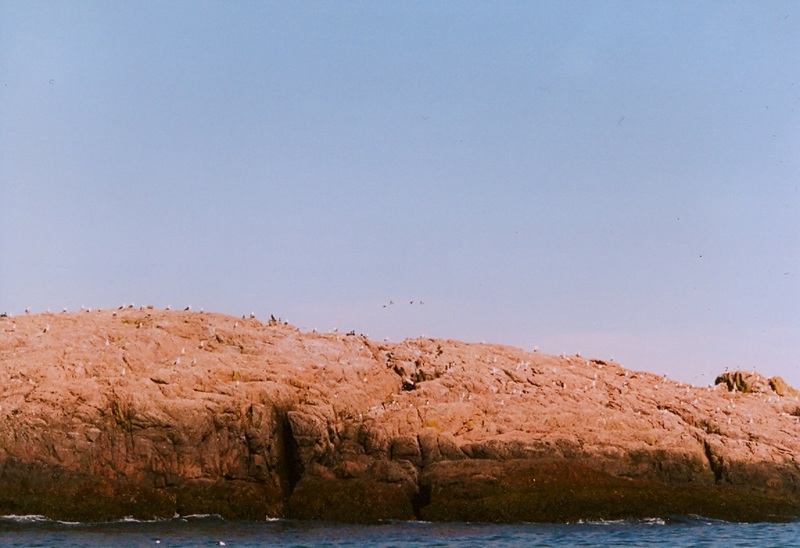 Seal Island, Razorbills re colonized this island in 1999, by 2010 there were about 20 pair breeding on the island, unlike many of the other sites, there is a lot of habitat on this island, and so this site has great potential for increase. 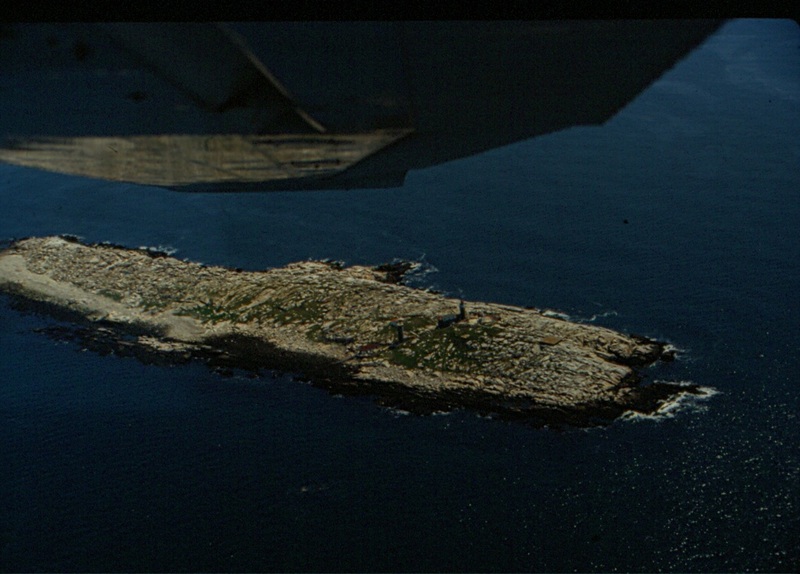 Matinicus Rock, Razorbills first recolonized the island about 1967, C. Buckhiester, by '77 Mr. Buckheister estimated 15 pairs. 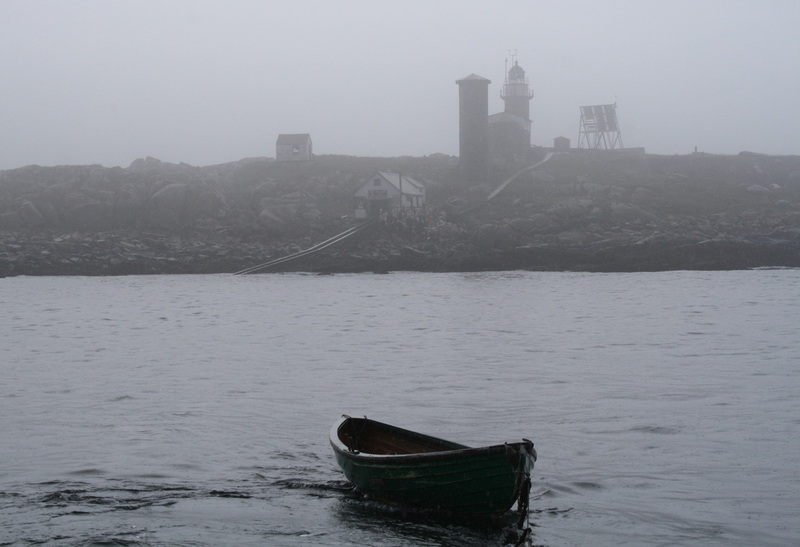 there were almost 400 active breeding sites found on the island in 2010. There was count of over 1000 individuals near the island in 2012.
there have Been Razorbills on a new site Green Ledge off Criehaven during the last several years, a few pair have apparently expanded from nearby Matinicus rock, presumably inspired by crowded conditions at the source.